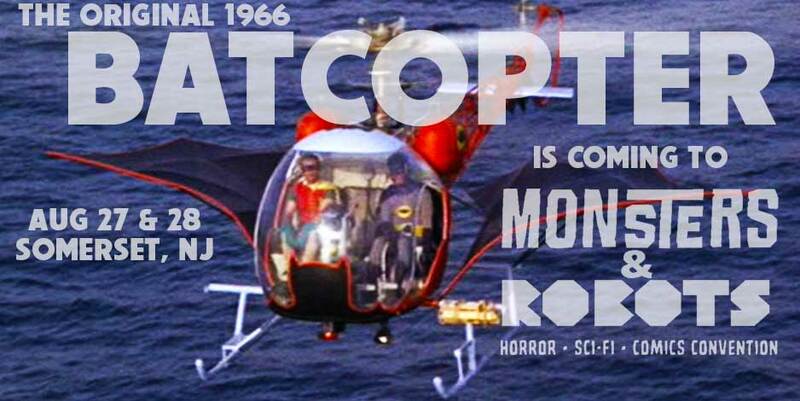 Home » BATMAN'S HOT-LINE » The BATCOPTER is Coming! Your chance to sit in the greatest of flying machines — this weekend in the New York-New Jersey area! Monsters & Robots, a new pop-culture convention brought to you by the folks at East Coast Comicon, is this weekend — 8/27 and 8/28 — at the Garden State Convention Center in Somerset, N.J.
Now, I’ve had couple of close encounters with the Batcopter itself and it’s everything you hope. 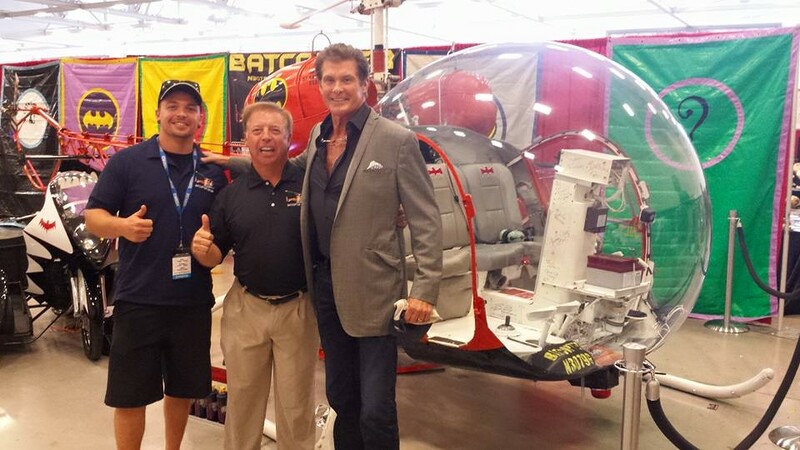 The Batcopter won’t be flying at the show but you will get a chance to sit in it for $20 per person, including photos. (Capt. Eugene Nock and his traveling family will take pix on your camera for you.) Plus, they’ll be selling T-shirts, Capt. Nock tells me. They have a nice, colorful set-up, with banners that include logos from the TV show itself. That’s Eugene Nock in the center and his son Wilson on the left. That’s David Hasselhoff on the right. He will not be at Monsters & Robots. I just wanted to give you a glimpse at the banners! Now, how can you get tickets to Monsters & Robots? You can click here for more info, including the full line-up of guests. Or, if you’re feeling lucky, you can enter our contest to win a pair of Sunday tickets to the show, here. Oh, and what’s next for the Batcopter? The prestigious Cleveland National Air Show, Sept. 3-5. Click here for more info!